Offered in bulk for the cater trays. 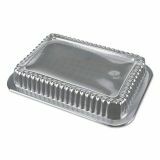 Durable Packaging Dome Lids for 1.5 lb Oblong Containers, 500/Carton - Dome lids are offered in bulk for the cater trays. For oblong and round containers.